October 18th 2018 marked the 50th Anniversary of the Scimitar GTE first being unveiled to the public at the 1968 London Motor Show. 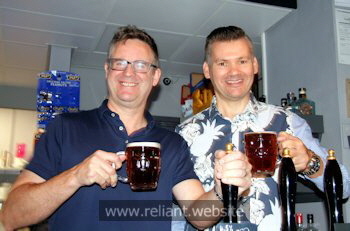 In addition to Elvis Payne’s book, The Reliant Scimitar, the RMC teamed up with the Tamworth Brewing Co. to unveil a new commemorative beer called Scimitar, Founded in 2018 by George Greenaway and located at 29 Market Street, Tamworth, the new micro brewery has already won a number of awards as well as being listed in the 2019 CAMRA Good Beer Guide. The Scimitar beer is brewed on site and was launched on the 50th Anniversary (18/10/18) of the Scimitar GTE alongside Elvis’ Reliant Scimitar book. George describes Scimitar (which is 4.5%) as “a traditional bitter made from English hops with a malty after taste”. Elvis (RMC Chairman & Historian), Caroline (RMC Secretary) and Harvey Payne were at the launch of the beer and sampled the first pint of Scimitar enjoying it immensely. The Scimitar beer was very well received, especially with those familiar with the GTE agreeing that it was just as good as the car itself and so it was a fantastic way to celebrate the 50th Anniversary. 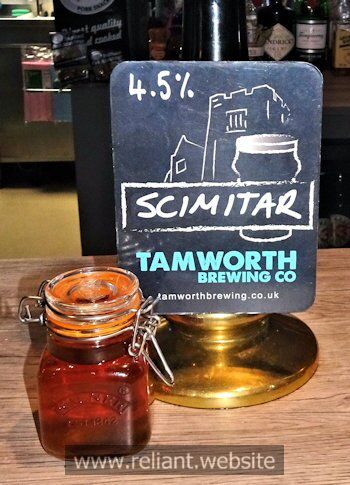 Tamworth Brewery Co. create a number if in-house ales and we are proud that a Scimitar beer has featured among them. Our thanks go to George at Tamworth Brewery Co. for helping is to celebrate the 50th Anniversary in such a unique (and very tasty) way. The news was also detailed on the Tamworth Informed website with this article. 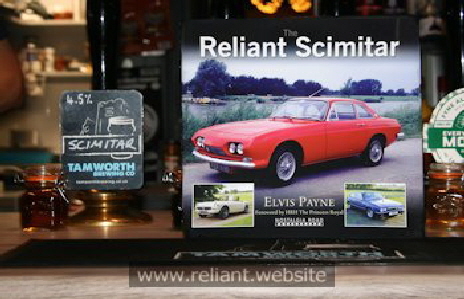 To commemorate the 50th Anniversary of the Scimitar, a new Scimitar beer and a new Reliant Scimitar book. The creator of the beer and owner of Tamworth Brewing Co., Georger Greenaway (left) and Elvis Payne with a pint of Scimitar.